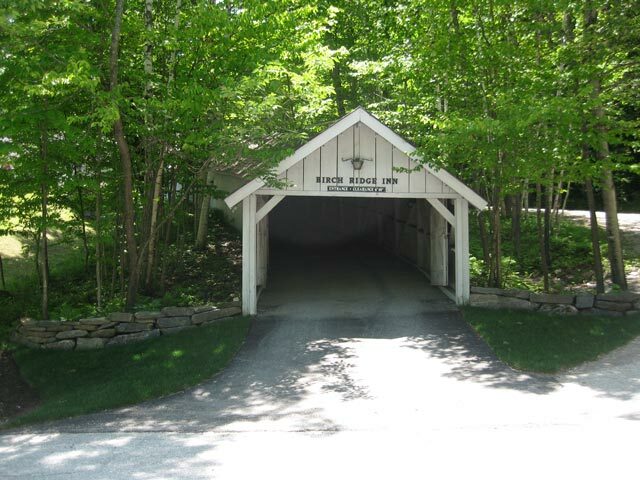 The entrance to the Birch Ridge Inn is through a Covered Carriageway, reminiscent of a Vermont Covered Bridge. Built to keep snow from covering the driveway leading to Birch Ridge, the Carriageway offers inn guests a protected entrance to the property. Covered with a slate roof, the Carriageway is an unforgettable landmark. The Carriageway is approximately 120 feet long. Located on Butler Road, it has an uphill grade to reach the main grounds of the Inn. For those of you with vehicle clearance requirements greater than 7 feet, there is a driveway directly to the right of the carriage way. With a maximum vehicle clearance of 6 feet 10 inches, most cars and sport utility vehicles comfortably fit through the Carriageway.